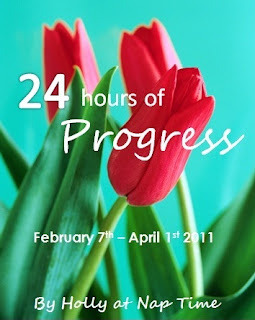 I realize that I'm behind on the 24 hours of progress. Sometimes I get so excited over a series that I forget that "real life" also has to happen at the same time. ;) Good thing I make the rules here. Clean the Inside of Your Oven: A couple times a year you should clean out the inside of your oven. Things bubble over, little bits of cheese fall into the bottom, and it's just good practice to keep things spiffy. Many newer models of ovens have a "Self Cleaning" feature that includes extremely high temperatures and stinky fumes. While this is an efficient way of cleaning your oven, it shouldn't be done if you are pregnant or have small children in the home. The house should also be well ventilated. I would personally choose a foam based cleaner like Easy Off. Sure it takes a little more work, but it won't leave my house smelling terrible all day. Freshen Up Your Garbage Disposal: Garbage disposals are a wonderful household tool. They make kitchen prep and clean up a lot easier. After awhile though, odors can build up in your garbage disposal. Like a perfume, if your nose is already used to it you might not even realize that there is something smelly stirring down there. To freshen things up, toss a lemon peel down there and run the disposal. Follow up with a sprinke of baking soda, and let it set for awhile. It'll be sure to block out any odors.